Our Stollen are made in the traditional Dresden style. For over 50 years we have been crafting a wide range of delicious specialty breads and treats based off of traditional recipes. Trust that we use only the finest natural ingredients and traditional techniques to achieve the most exceptional results. An old world favorite just like grandma used to make. 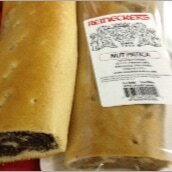 Our very own nut and poppy seed filling, rolled in a natural sweet dough. Just a few seconds in the microwave and they are oven fresh. ​Ingredients: Flour (bleached wheat flour, potassium bromate, malted barley flour), water, walnuts or poppy seeds, sugar, soybean oil, corn syrup, eggs, butter (cream, natural flavorings), salt, yeast. 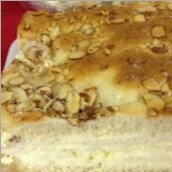 A real treat, this kuchen starts with our sweet dough and is topped with a secret, butter, sugar, and almond toffee topping. Baked to a golden brown, then we fill it with our famous buttercream filling. Ingredients: Wheat and malted barley flour, sugar, butter, almonds, custard, soybean oil, milk, water, eggs, yeast, salt. A light sweet dough crust, filled with fruit filling and topped with streusel topping. 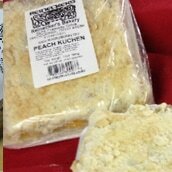 Ingredients: Sugar, flour (bleached wheat flour, malted barley flour, potassium bromate). Partially hydrogenated vegetable oil (soybean and palm oil), water. Cherries, apples, or peaches, baking powder (corn starch, bicarbonate of soda, sodium aluminum sulfate, acid phosphate of calcium), eggs, corn starch. 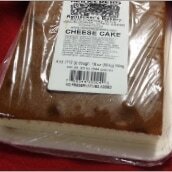 ​If you enjoy cheese flavored desserts, you'll want to try this one. We start with bakers cheese, then add eggs and fresh lemons and bake to a golden brown. ​Ingredients: Bakers cheese (cultured skim milk, milk protein, enzymes, potassium sorbate), sugar, flour (bleached white flour, malted barley flour, potassium bromate), water, eggs, partially hydrogenated palm and soybean oils, corn starch, baking powder (cornstarch, bicarbonated soda, sodium aluminum sulfate, acid phosphate of calcium), salt, lemon flavoring (water, propylene glycol, acacia gum, xanthan gum, citric acid, sodium benzoate). The Polish call it Bobka, the Slovenians Paska, and the Americans just call it delicious. Almost overflowing with black and golden raisins as well as sliced almonds for breakfast or as a dessert, this one's great any time of hte day. ​Ingredients: Flour (bleached wheat flour, malted barley flour, potassium bromate), black and yellow raising (sulfur dioxide), almonds, water, sugar, eggs, butter (cream, natural flavorings), yeast, salt.